This guide offers an outstanding overview of the finer points of pencil work, both for sketching and detailed finished drawings. 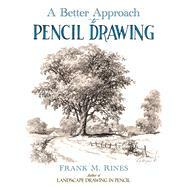 Author Frank M. Rines discusses approaches to graphite work and techniques for still life and landscape drawing. He emphasizes the importance of good design and composition as well as accuracy, showing how to develop an outlined drawing by adding lights and shadows together with the suggestion of color and texture. Suitable for artists and art students of intermediate and advanced skills, this single-volume edition combines two instructional manuals by Rines, Pencil Drawing and Pencil Sketches. Plentiful illustrations include full-page images as well as smaller images and progressive examples that demonstrate the use of perspective, the contrast of light and shade, and other elements of technique. Subjects include rustic scenes and rural landscapes, with many valuable tips for drawing trees, flowers, doorways, and buildings. Frank M. Rines (1892–1962) specialized in graphite work and landscape art. He taught at many schools throughout New England and published five books on drawing and technique. His paintings are among the collections of the Boston Museum of Fine Arts, the Fogg Art Museum, and other major institutions.